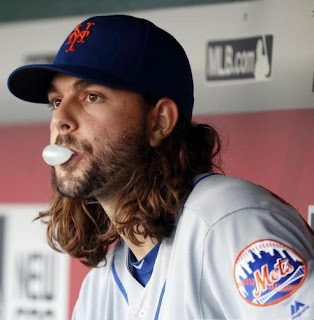 Robert John Gsellman was born July 18th 1993 in Santa Monica, California. The six foot four right handed pitcher, was a star baseball player & basket player at Westchester high school in California. He batted .649 in his junior year & was noticed as a star athlete getting named to ESPN's Rise underclassman All California team. In 2011 he was drafted by the New York Mets in the 13th round. He remained at the A ball level playing with the Kingsport Mets, Brooklyn Cyclones, St. Lucie Mets & Savannah Sand Gnats through 2014. In that time he developed his two seamed fastball. After posting an impressive 6-0 record with a 1.76 ERA, at St. Lucie in 2015, he was promoted to AA Binghamton where he went 7-7 with a 3.51 ERA. His wild ride on 2016 began at AA Binghamton where he went 3-4 with a good 2.71 ERA. He was brought up to AAA Las Vegas, a hitters paradise, where he was just 1-5 with a 5.73 ERA. 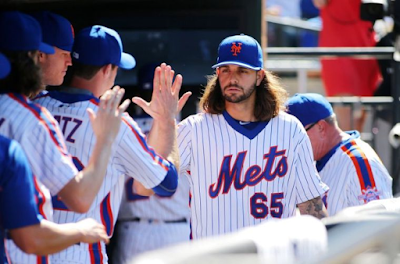 In late August he was brought up to the Mets staff to replace the latest Mets pithing casualty; Steven Matz. The Mets had already lost Matt Harvey & Jacob deGrom. On August 23rd he made his MLB debut, coming in relief for Jonathan Neisse who had pain in his knee. Niese would also go down for the season. 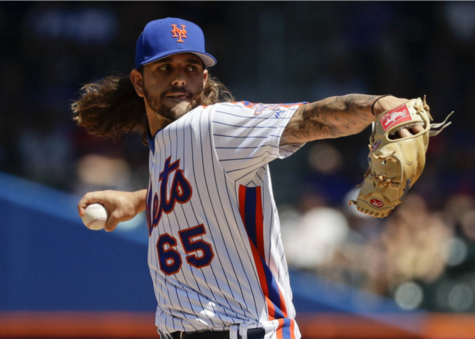 The young man who resembled Jacob deGrom due to his long hair found himself in the big leagues, filling some big shoes in a pennant race in the worlds largest stage. 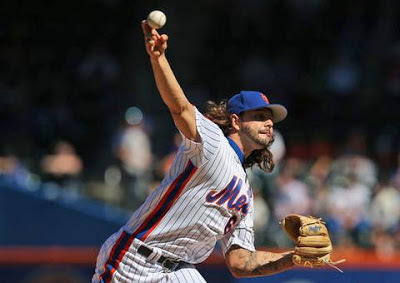 In that first game Gsellman would pitch from the 1st thru the 4th inning shutting out the Cardinals in St. Louis, earning his first win. The Mets swept the series & turned their season around on their way to capturing the NL wild card top spot. His next game wasn't so good, as he lost to the Philadelphia Phillies. On September 3rd, he found himself in a big spot at Citi Field, taking on the first place Washington Nationals. Gsellman pitched six innings, allowing just a run, walking three with six hits & four strike outs as the Mets went on to a 3-1 win. The Mets offense was led by a two run Curtis Granderson single. 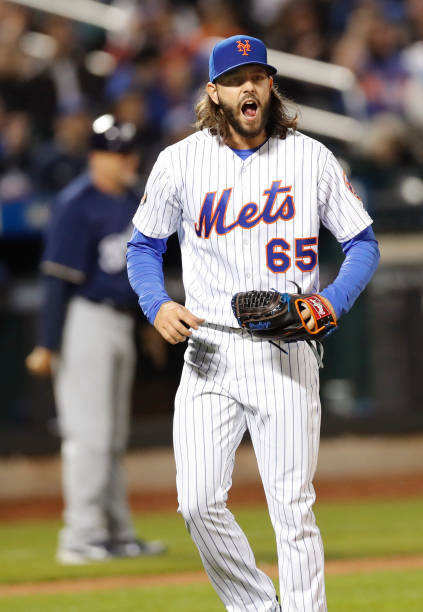 On September 9th he got no decision allowing four runs in a 6-4 Mets win at Atlanta. 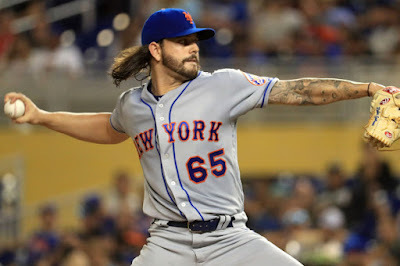 After another no decision in Washington where he pitched five shut out innings, but the Mets lost 1-0 to Tanner Roark, he took another loss to the Braves. On September 25th, he had an outstanding performance, pitching seven shut put innings & striking out eight Phillies in the Mets 17-0 rout over the Phils. Impressively he also retired 16 of the final 18 batters he faced. 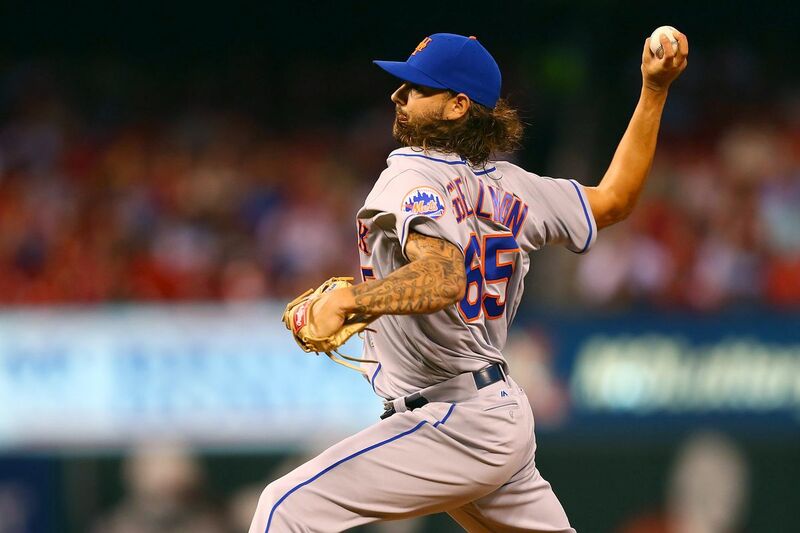 Gsellman even got his first MLB hit when he bunted safely off pitcher; Jake Thompson in the 3rd inning. That win once again put the Mets atop the NL's top wild card spot. 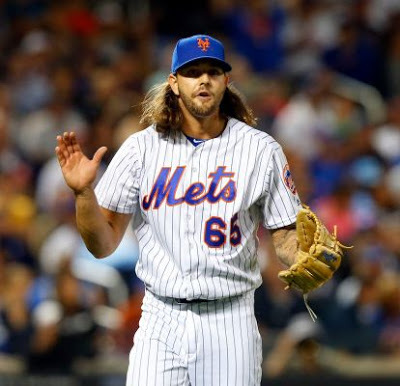 On Friday September 30th, the Mets guaranteed themselves of at least playing for a wild card tie breaker, as the beat the Phillies in Philadelphia 5-1. Gsellman allowed seven hits but pitched out of trouble as he would allow just one run. He struck out seven & earned the victory. 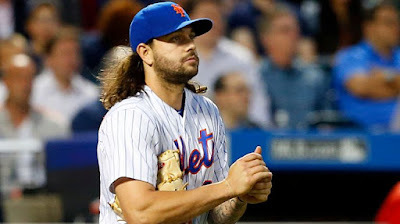 Gsellman came out of no where in 2016 & gave the Mets a chance every time he took the mound in September. He was 4-2 pitching in eight games, striking out 42 batters while walking 15 in 44 innings posting a 2.42 ERA. 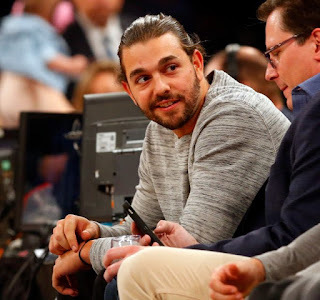 After the Mets season ended, Gsellman under went arthroscopic surgery on his non throwing shoulder to repair a torn labrum. In 2017 he began the year with two losses in April & closing the month with a 6.23 ERA. He began May with two straight wins although he still gave up eight runs in those two starts over ten innings. He saw some time in the bullpen then returned for a decent start on May 24th against the San Diego Padres. On May 29th he had one of his best games of the year. He threw seven innings allowing two runs (one earned) on just three hits striking out five Milwaukee Brewers at Citi Field, for his third win. He would win three straight, beating the Pittsburg Pirates with six strikeouts in his next start & then a six & two thirds of an inning shut out, against the Braves in Atlanta on June 10th. From there he collected three straight losing decisions, with three no decisions as well. Three wins in September highlighted by a six inning one run win over Atlanta in his final start of the year got him to 8-7 with 5.19 ERA. 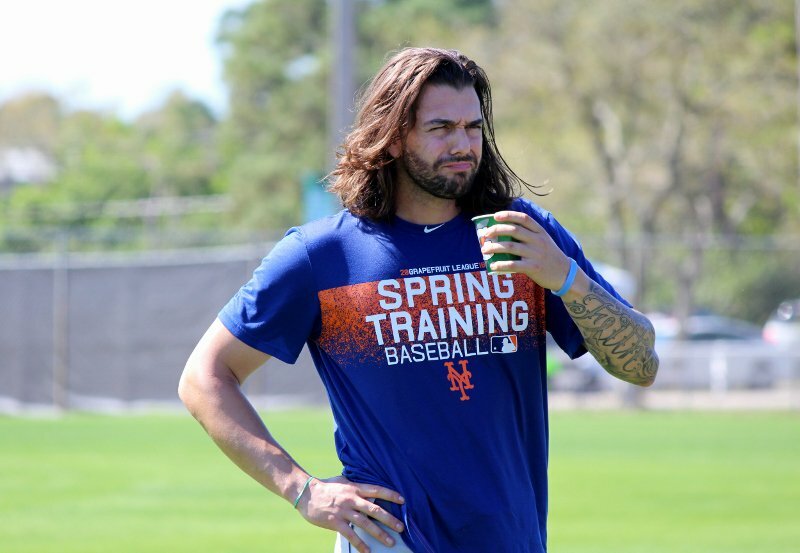 Gsellman had 82 strike outs with 42 walks in 33 games over 119 innings of work. He fought for a spot in Spring Training 2018 under new manager Mickey Callaway. Callaway & new pitching coach Dave Eiland placed him in the bullpen where he has done well. On April 4th he earned his first win, with a two inning shut out relief appearance to beat the Philadelphia Phillies. On April 20th another two inning shut out relief outing got him win #2 in Atlanta. Then four days later he was credited for a win in St. Louis. He then lowered his ERA under two heading into May. On May 2nd, he suffered a four run pounding by the Braves in just one inning of work, raising his ERA again. He allowed run in his next two outings as well before settling down. He then went six games without allowing a run & picked up another win as well as his first save, which came on May 20th against Arizona. Thru May he was 4-1 with a 2.81 ERA. In June he had two holds, then was credited with a save on June 17th in Arizona. On June 20th he blew a save in Colorado & the Rockies went on to a 10-8 win. Three days later he had a disaster of an outing, allowing five runs to the LA Dodgers at Citi Field. On July 3rd he blew his sixth save of the year seeing his ERA top out at 4.44. The next day he received a hold a on the Fourth of July. On July 9th while pitching a scoreless 8th inning against the Phillies, he earned a win when Bandon Nimmo hit a walk off HR. On July 13th he earned his 4th save. He went to the half way point at 6-2 with 4 saves & a 4.31 ERA, leading the club with 43 appearances. He struck out 50 & walked 21 in 54 innings of work.